Keynote Speaker. Speech Coach. Public Speaking Trainer. SHOW UP. SPEAK UP. STEP UP. A keynote presentation for professionals who want to step into the spotlight and maximize their leadership impact. You have a product to sell, a service to provide, a message to deliver… a big idea that can make a big difference in people’s lives. You could share your big idea with more clarity and confidence. You weren’t afraid you might fail to deliver on the speaking platform, in the crucial conversation, in the sales meeting. You were able to own the room as a speaker and leader. That’s where I come in. I use theatre tools to help you be real, relaxed and confident when you speak and lead—techniques learned as a young actress in New York City and Los Angeles struggling to perform at my best in high-stakes auditions. 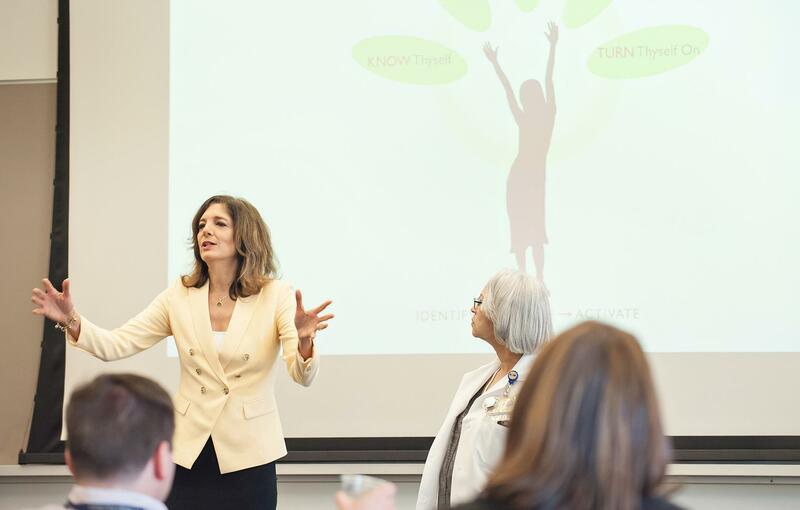 In over a decade as a speech coach, keynote speaker, and presentation skills trainer, I’ve helped countless executives ignite and expand their transformational presence. Your voice matters. Use your words to change your world. TAKE THE STAGE! A keynote presentation for professionals who want to step into the spotlight and maximize their leadership impact. Do you feel stuck in the wings– unnoticed, unexpressed, and unfulfilled? Is something holding you back from speaking up during meetings, or having a more visible public presence? Do you want to find the courage to step into greater leadership and expand your influence? In this presentation you'll learn the seven-step process that propelled Eleni's shift from waiting in the wings as a frustrated actress to taking center stage as a touring singer-songwriter, presentation skills expert, author, and motivational speaker. And because this program is interactive, you'll be inspired to drop your coat of invisibility and take the stage in life and work. Looking for a magnetic & motivating 1-on-1 coach? Tired of letting fear and limiting beliefs keep you from owning the room as a speaker and leader? Want to ace that interview, make that sale, motivate your team? Individual speech coaching or leadership presence coaching can help you be more real and relatable in your meetings and presentations. Need a facilitator for a workshop, seminar, or training? Are your team members losing sales, confusing clients, or repelling potential customers due to humdrum, ho-hum or hazy presentations? Customized group presentation skills training can improve their communication and elevate their confidence, presentation content, and presence. In search of a unique & powerful keynote speaker? Are your employees, leadership team or association members struggling to fulfill their potential? My roof-raising keynotes, delivered with humor, stories, practical content, and a theatrical flair, can help your team members expand their presence, reconnect to their passion and purpose, and perform at their peak. Watch the video to get to know a little more about me and how I might work with you or your team as a speech coach, keynote speaker or presentation skills trainer.